Live in Cataluña for any length of time, and inevitably, you’ll experience a Calçotada. What’s a Calçotada? Well, I can tell you that it’s not a Catalan dance, a side-splitting headache, or a type of monster that hides under the bed and eats small children. Nope. It’s an enormous sweet onion festival! Each year when the boughs of the almond trees are thick with delicate pink blossoms, the calçot season, lasting only six weeks, gets into full swing. Calçots (pronounced kalsot), a cross between leeks and spring onions, are considered as integral of an ingredient within the Catalan culture as is butifarra (Catalan sausage) and tomatoes spread over toasted baguette drizzled with olive oil and garlic. In appearance, they are quite similar to a thick green onion, but have a magnificent oniony sweetness that goes perfectly with the traditional rich and thick Romesco sauce, containing dried mild red pepper, ground almonds, roasted garlic and olive oil. Culturally, its roots (no pun intended) trace back to a lowly little farmer named, Xat de Benaiges, who happened upon the calçot during the late nineteenth century in the region of Valles, located two hours southwest of Barcelona. Although we’re not sure exactly how Xat came to idea of tossing a handful of these spring onions onto the hot embers of roaring winter’s fire, but I’d like to believe that he was a gourmand at heart, rather than just hungry. With a glass of cava in hand, he took a long luxurious sip, placed the glass back onto the table and carefully, picked up the charred onion from the flames. Peeling back the first layer of black, sooty, skin, he took a bite, and swooned from pure ecstasy. Licking his charcoal covered fingers, he picked up the second calçot from the fire, but this time, dipped it in fresh plate of olive oil with a dash of salt. After yet another sip of cava, followed by the sweet, juicy flavor of the onion, and Xat was completely addicted. Having told all his friends and family how magical this vegetable was, word spread, and by the early 1900s, Valles had gained the illustrious reputation as the birthplace of the annual Great Calçotada Fiesta that takes place on the last Sunday in January. 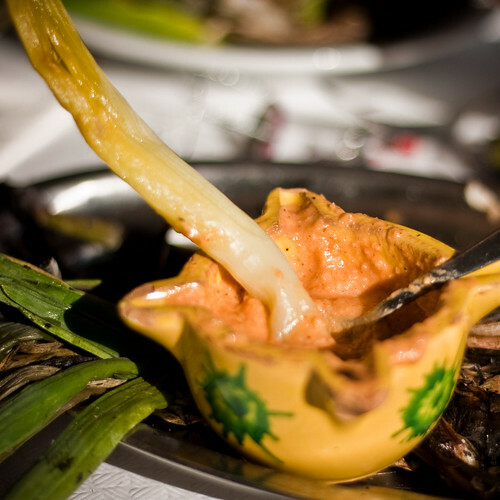 Although Xat deserves full credit for the Calçotada, the physical origins of the onion transcend the borders of Cataluña to the Middle East, where traces have been found in excavations dating back to 5000 BC. It probably took another 2,000 years before it was cultivated by the Egyptians, to whom it symbolized eternal life. In ancient Greece, athletes consumed large quantities of onions, believing it improved circulation and balance. Columbus, who brought us peppers, tomatoes, potatoes and syphilis from the New World, in return introduced the humble but versatile onion when he landed in Haiti in 1493. The vegetable is rich in minerals and vitamins and contains the important anti-oxidant quercetin. However, they are surprisingly high in calories, on par with potatoes, and typically make me cry like a little girl if handled raw. One suggestion given to me by a local Catalan was to wet both my hands and the onion before cutting it. Although unnecessary for a calçot, as they go straight from bag to grill, it’s a great technique for traditional white onions. We will have the great privilege of attending at least one Calçotada on the roof of our neighbor’s house come January. Antonio and his wife have been our fruit venders for over a year now, and they have kindly invited us to share a bottle of cava and charred Calçots with them, sharing in the age old Catalan tradition. The other Calçotada is located it Sant Sadurni, a little town just southwest of us in Alt Penedes, renowned as the Cava capital of Spain. With luck, you’ll soon see photos of us completely covered in sweet onion juice in less than a months time! Although neither Ryan nor I have ever attended a traditional Calçotada, we have had the experience of creating our own version of the tradition on our rooftop terrace. With an enormous bag of Calçots sitting alongside the grill, we’ve laid them across the searing grates until the sheath of the onion turned an inky black. For those in the know, the tradition dictates that you’re provided an apron and a terracotta bowl of romesco sauce, but because we weren’t privy to this information, we handed out rolls of paper towel and buckets of water to clean both hands and faces. This is tactile eating at its best. Stripping the charred outside of the sheath off, dip or drag the white part of the calçot through the thick sauce (or simply olive oil and salt) and lower it into your mouth, biting off the juicy, tender bottom half. What I’ve provided below is a traditional recipe used by my friend’s grandparents. Although she wasn’t clear if the recipe first began by her great-grandparents, she holds fast to the notion that it’s the “best” Romseco recipe in Cataluna. In a bowl, place a dash of salt, garlic, almonds, hazelnuts and tomatoes. Begin blending them together, with either a mixer or blender, while slowly adding oil until you obtain a constency ideal for dipping. According to the tradition, thicker is better; however, my friend swears that a slightly thinner consistency allows you to spread it more evenly across the bulb. Once you’re satisfied with the sauce, you can do one of two things. You can simply place the toasted bread on top of the sauce, sprinkling just a dash of red pepper; or you can cut up the bread and blend it into the sauce if you want a thicker consistency. The choice is yours!